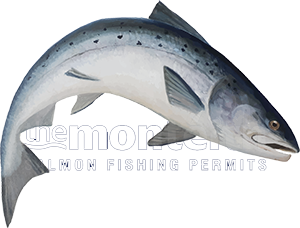 The Atlantic salmon really is one of the world's most fascinating creatures for many reasons like the ability it has to make the transition from fresh water to sea water when nature sends it to the rich feeding grounds off the coast of Greenland and the Faroe Isles. At sea these fine fish pack on bodyweight over a one to four year period before the call of nature sends them back to the fresh water rivers to start their reproductive cycle all over again. Salmon are widely known to return to the same stream of their birth although scientific micro tagging study research has located Scottish salmon in Norwegian rivers which means this theory is not 100% accurate. I think the best way to view this is to make a comparison with our human species and understand that genetic evolutionary gene splicing has to also naturally occur to guarantee the genetic intergity of the species and like the human race salmon also have natural exploration instincts. It has always amazed people as to how these fish can navigate thousands of miles to & from their oceanic feeding grounds but from what I've seen over the years here are my views. As a professional salmon guide you get to know intimately where salmon will hold up on any individual stretch of the river. On any salmon fishing venue where over head power lines cross the river you'll always find a salmon lie directly underneath the wires. The above is no doubt due to the electro magnetic field caused by live power cables which confuses the salmon's navigational instincts the same way your compass needle would spin if you walked under the same power cables. Great care however must be taken not to be casting close to these man made constructions due to the potential power surge that can arc the electrical current to a fishing rod and cause serious injury or death even when these cables are position high up off the river. The only way to fish these areas is with a long line from an upstream boat or riverbank position and never close to the overhead wires or within the often signposted 'no fishing' areas. To confirm my theory on the magnetic field that salmon use to navigate I recall power lines being re-sighted by the electricity company on one of the salmon beats I used to work on and amazingly the salmon lie moved instantly to the new power line location and no further salmon were ever seen or caught at the old location which had produced salmon for decades since the wires where originally installed. This was all the proof I needed regarding how salmon manage to navigate to sea and back as it became clearly obvious that the magnetic field could be the only viable explanation.